Execute is a common Willpower action card. It is part of the Core Set. In addition to the card's availability in the Core Set, two copies are included in the Ancano's Cunning theme deck, and two copies in the Tribunal Glory theme deck. 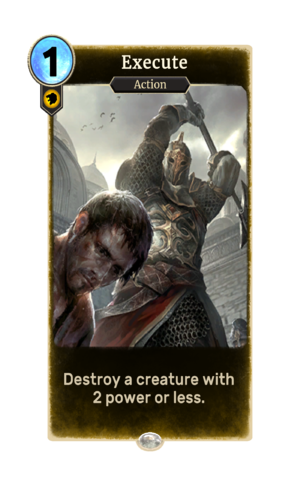 One copy is also obtainable in the Band of Survivors deck as a potential reward from Bandit Ambush.